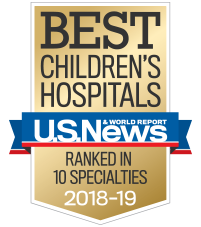 Through the nationally ranked Aflac Cancer and Blood Disorders Center, Children’s Healthcare of Atlanta is able to provide compassionate, comprehensive care to children battling cancer. Our expert team also specializes in the treatment and diagnosis of tumors, anomalies and other malformations. As one of the top transplant programs in the U.S., we offer comprehensive services—from helping parents prepare to assisting them during recovery. As a leader in children's cancer care, we offer innovative medical treatment and educational and emotional support in a child-friendly environment. Our full-day therapy program helps children with debilitating illness or injuries regain function and independence. Our team is experienced in the medical and surgical management of females ages 0 to 21 with a wide range of gynecological issues. Our therapy program helps children recover from a life-changing injury or illness, including brain and spinal cord injuries, heart problems and burns. Our recreational therapies help children and teens resume activities they enjoy and introduce them to new interests. Our expert team specializes in the diagnosis and ongoing care of children with vascular anomalies, which include tumors and malformations.